Northwestern Information Technology recently introduced Blue Jeans, a web conferencing platform that integrates with Canvas. Blue Jeans is now available in all Canvas sites at Northwestern. Adobe Connect does not have single sign-on automatic Canvas integration, but it does feature audio and video conferencing, computer and phone audio connection, a customizable layout, whiteboard and polling options, and file sharing. Conferences can be recorded after real-time playback as an FLV or mp4. BlueJeans is integrated with Canvas and can be accessed using the Northwestern login. It also includes audio and video conferencing and computer and phone audio connection, but does not have a customizable layout, whiteboard, or polling. File sharing is limited to videos, and conferences can be recorded as mp4s. After choosing a web conferencing platform, faculty should send clear access and support instructions to their students. Support for BlueJeans is through BlueJeans and Northwestern Information Technology and can be accessed by clicking the Help button in a BlueJeans meeting, e-mailing consultant@northwestern.edu or calling 847-491-4357. Support for Adobe Connect is through SPS IT and can be accessed by e-mailing spsconnect@northwestern.edu and sps-it@northwestern.edu or calling 312-503-3333. 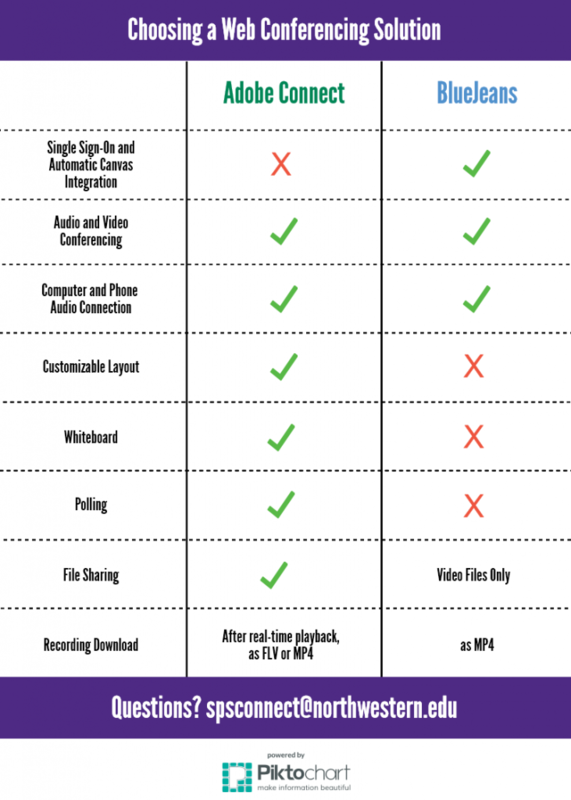 If you aren’t sure which web conferencing platform to use, please reach out to an instructional technologist at spsconnect@northwestern.edu.